As you begin to purchase stocking stuffers for this holiday season, Circuit Mania and Skooob are two products you should consider. Fun with Conductivity, LED Light and Power! Learn all about conductivity, power sources and circuitry all with this fun, easy-to-do project right at home. Designed for STEAM learning, kids will be engaged and their creativity will flow with this easy to use kit. 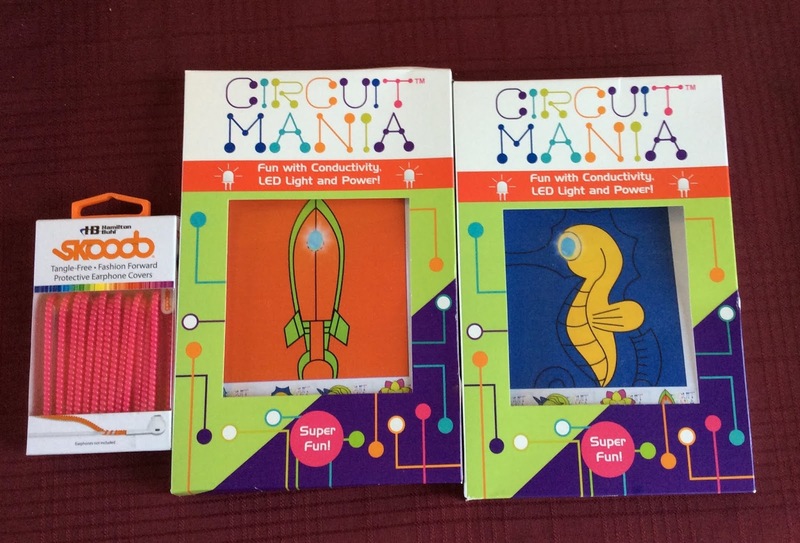 All key components are included: conductive tape, LED light, colorful construction paper, template and cell battery. Multiple templates available, so kids can collect them all! Enjoy your music and take calls uninterrupted by eliminating the need to untangle your headphones with Skooob, the new hassle-free and stylish accessory for your earphones! Skooob eliminates the tangle mess while adding a personal touch to any pair of earbuds or headphones. Features a wide selection of colors and easy to use, simply twist the Skooob around the cord starting at the jack and work your way up towards the earbuds. Then simply cut the Skooob when it reaches the two separate earbud wires. Continue to twist each individual earbud until done and your all set! You're earbuds will never tangle again!